In my last post, I wrote about St Petersburg. But what I didn’t say, was what happened next. That was just the first half of our holiday and it was all about imperial grandeur and revolution—the second half was very different. We went to visit my son who lives in Latvia, and decided to travel by overnight bus. I love the idea of going to sleep in one country and waking up in the dawn light of another one—and somehow, I managed to persuade my husband that this would be fun. So, on Sunday evening, after four busy days in St Petersburg we made our way out to the Ecolines bus stop on the edge of the city. Three buses to Minsk arrived and eventually we climbed aboard our bus to Riga. We then had several hours of bumping along narrow roads through isolated Russian settlements where wooden houses stood at odd angles as though they’d been dropped randomly on the ground. 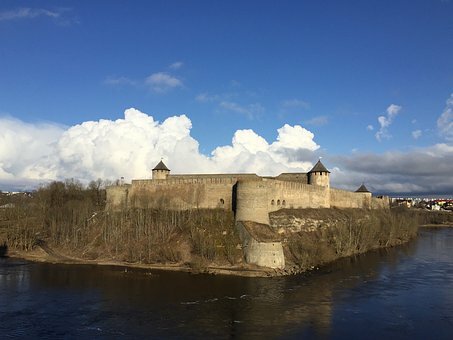 Around midnight we reached Narva on the Estonian border and the landscape changed. The first thing we saw was a floodlit medieval castle. By dawn, we were in Latvia and got to Riga in time for breakfast. It has the highest concentration of Art Nouveau buildings in the world so there was plenty to see, as well as taking in Orthodox churches, walks by the river, and reminders of Latvia’s troubled history and multiple occupations. It’s a very attractive capital city. On the third day, our alarm went off early and by 7am we were on another bus—this time going to the coastal town of Liepaja where my son lives. The Latvian language has no word for ‘mountain’ and the flat countryside is all about deep forests and countless little lakes. One of the joys of travel is spotting things that you don’t get at home, and I loved seeing storks with their long legs and big untidy nests perched in unlikely places. My son told me proudly that Latvia is the storks’ favourite country. 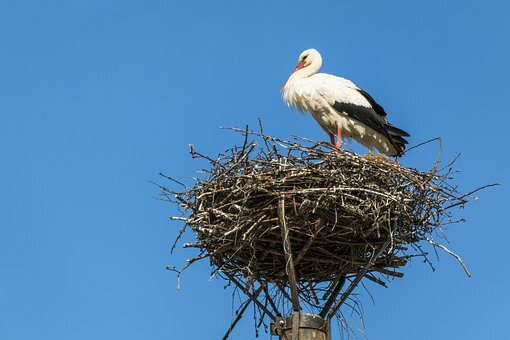 Obviously no one has interviewed them about this but it seems to be true as there are more white storks in Latvia than in every other European country put together. People put up high posts in their gardens to encourage nest-building. Latvia likes the storks—and the storks like Latvia. As we passed the dark pine forests I started thinking about the animals that might live there and remembered some of the stories my son has told me. One was about Ruhnu island off the coast of Latvia. About seventy people live on it, and a few years ago they were joined by a large brown bear. No-one knew how it got there as the nearest land is forty kilometres across the Gulf of Riga. The most likely explanation was that it floated across on a piece of ice. It didn’t cause any trouble, and then it just disappeared. Presumably, it simply took an ice floe back home again. 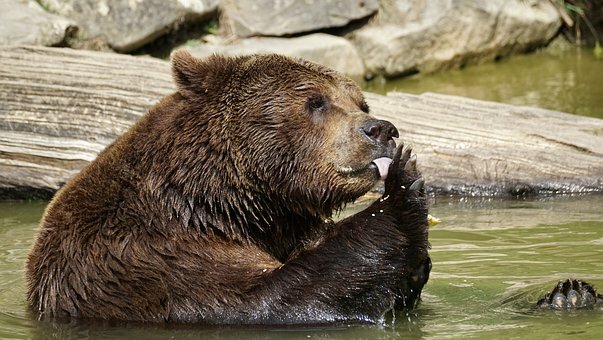 To commemorate this event, a Latvian confectionery company made a forty kilogram chocolate statue of the bear and presented it to the islanders. It took them eight months to eat their way through it. Another tale that came to mind, is the unlikely but true story of a deranged rodent. A Latvian man named Sergei was walking in the forest one evening when a beaver darted out, bit him on the leg and pinned him to the ground. 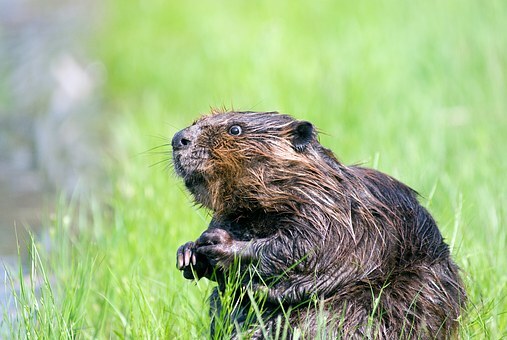 He did his best to escape but it was hopeless—the beaver was determined. After a while, Sergei managed to get through to the police and told them that he was being held hostage by a beaver. They put the phone down. Next, he called some friends and after some initial ‘oh yeahs’ on their part, was able to convince them that he really was in rather an awkward situation. They set off to help as fast as they could, but unfortunately got pulled over by the police, for speeding. They explained that they were going to help their friend who was being attacked by a deranged beaver. This didn’t go down well but they persisted, and eventually the police officers agreed to accompany the rescue party. They arrived to find Sergei still on the ground with the beaver standing guard over him. I’m not sure exactly what happened next, but I do know that Sergei lived to tell the tale. After three hours, we arrived in Liepaja which turned out to be an attractive old town. The beach is gorgeous with pale sand, tall pines, and open-sided cafés. But, it was shocking to learn that up until 1991 this beach had a watchtower, manned day and night and that soldiers would constantly rake the sand, tracking the footprints of anyone who tried to escape the Soviet occupation. We spent the final night of our holiday in Lithuania as we were flying home from Palanga. A minibus service, noisy and packed with locals, took us on the ninety-minute journey. 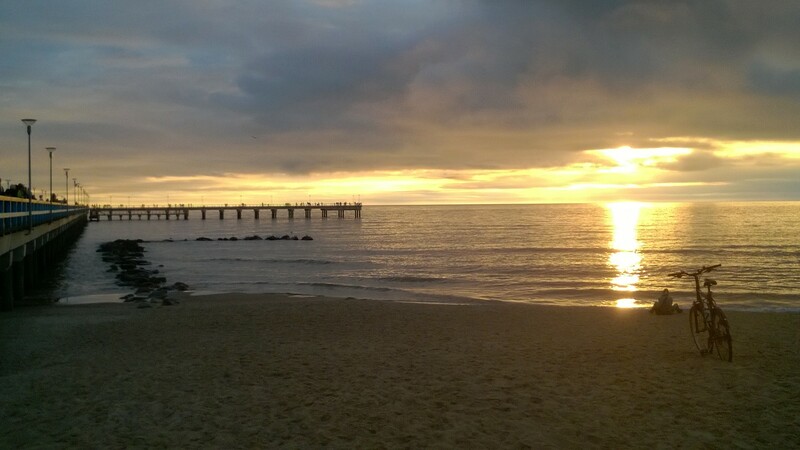 Like Liepaja, the beach at Palanga is clean and attractive. There’s a long pier and people stand along it, and watch the sun set. We were there during the ‘white nights’ season when the evenings are long and the nights short. It was overcast but when the setting sun did break through, it shone on the dark sea, creating a golden stairway to the beach. It was magical. The next morning we arrived at the airport in plenty of time for our flight. It’s so small that there are only two gates—‘left’ or ‘right’. Unfortunately, it was also so small that our incoming Ryanair plane couldn’t land in the fog and we hung around for several hours waiting to discover where it had gone. Eventually, we learned that it was in Kaunas, over two hundred kilometres away. An efficient, young employee had the unenviable job of passing on this news and was immediately surrounded by vocal passengers, demanding instant compensation from Ryanair. A less confident person might have crumpled under this onslaught but not her. 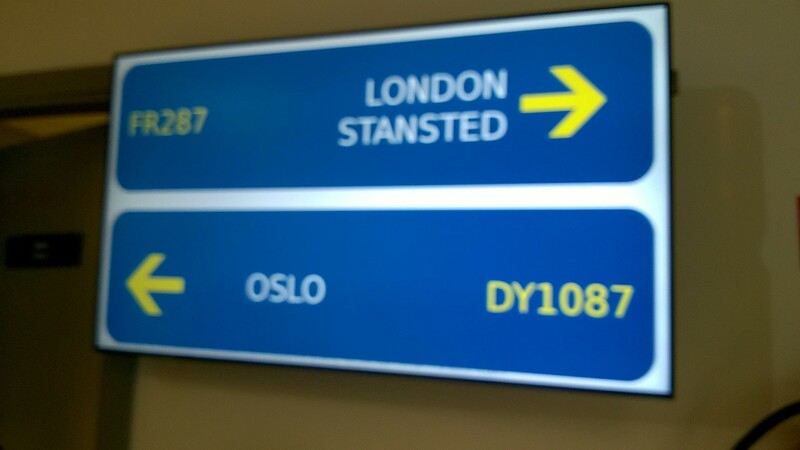 “My name is not RyanAir – my name is Monica” she said, with a great deal of dignity and just a hint of exasperation. Everyone laughed and returned to their seats. Nothing much happened for a while and then our Baltic holiday managed to pull one final bus journey out of the hat. Around lunchtime we all trooped out to a line of minibuses that had been provided to take us to Kaunas. “Oh well,” I thought. “At least it’s a chance to see some more storks.” I kept a careful watch as the bus sped across Lithuania and we all munched on sandwiches that had been thoughtfully provided by Monica. But try as I might, I didn’t see any at all and so must draw one conclusion–they really do like Latvia best.